This entry was posted in life, Personal, Random Thoughts and tagged Business, life, Personal, Psychopaths, Random Thoughts, Sociopaths, Weird. Bookmark the permalink. Yes, and you have to watch out for those trauma survivors… I wonder what the Meetup criteria are for what it considers similar groups? I KNOW! Those PTSD and domestic violence survivors will do you in. Maybe all of them will go on a big ADVENTURE! Your comment Lara stuns me, Being a trauma, PTSD and DV survivor, I don’t understand your comment. What type of adventure would you recommend after a woman in front of her kids gets her throat slit or beaten in the head with a mallet only to suffer irreversible brain injury..oh but never mind -she is dead, she cant go on an adventure. And you think this is funny?. Real funny.. It has nothing to do with the trauma survivor. It’s the fact it lists Financial planners, investment education, professional networking, and business strategy and networking. It’s not much of a stretch to find this rather amusing considering the state our nation is in thanks to the financial wizardry likely attributable to many sociopaths. 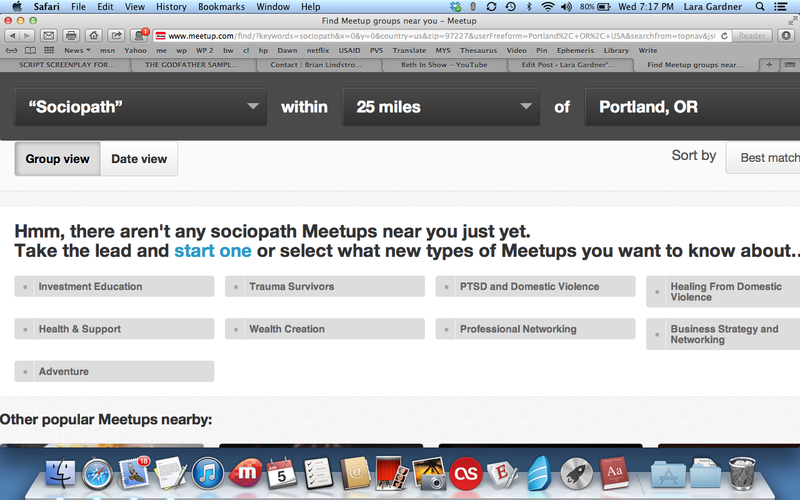 And by the way, the Hmmm, there aren’t any sociopath meetups near you about did me in. well, have to confess I’ve always regarded dedicated networkers to be sociopaths so I suggest we score five stars for this Meetup thingy. And hey, kiddo, did I not read somewhere on your blog about unsatisfactory online dating experiences? And here you go again???? Hmm . . . maybe there’s a splash of sociopath in your own dark mind. Maybe I’d better undo my Following? Bloody trolls everywhere (mutters he darkly as he retreats back into anonymity land) . . .
Oh, I don’t use Meetup for dating. I use it to find book clubs and sociopaths.